Other: Don’t go here if you’re a vegetarian. Just don’t. Rose and Sons is a breakfast-brunch-lunch-dinner place in the Annex with the kind of hype and bustle that is more easily accomplished with a small space. The place seats about 30 people, shoulder to shoulder in small booths and at the bar. There are no reservations for breakfast, brunch, or lunch, so when we went for Saturday brunch we were told there would be a 30-45 minute wait for a table for two. Fortunately the wait was closer to 20 minutes. Our seating at the bar gave as a good view of all the action in the open kitchen to our right– deeper insight into food preparation than usual. I got the grilled brie cornbread ($14)- a triangle of moist, sweet cornbread with a generous slice of brie melting over the top, topped with a slab of brisket (fatty beef- not quite melt-in-your-mouth, but getting there), a perfectly fried egg, a clump of caramelized onions, and drizzled with some buttery maple syrup and chili sauce. Layers of sweet, fat, and salt in all its forms– with just enough permutations on the theme to keep it interesting, and a pretty good balance of the flavours. 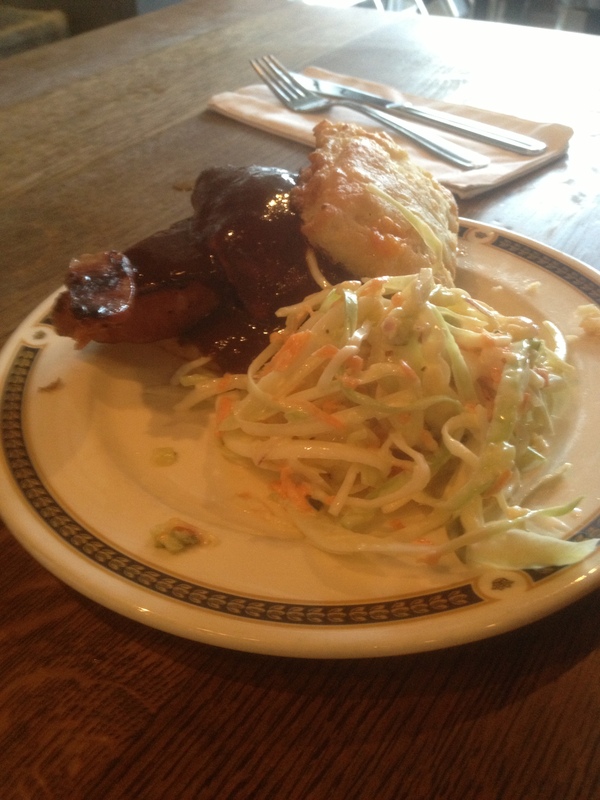 My dining partner had the egg in hell ($14)- a cheesy biscuit with bbq pork, bbq sauce, and a poached egg, with a side of coleslaw. Delicious, but less inventive and maybe a bit less well-executed than the first option. In terms of the service, the servers were nice enough, although their presence wasn’t well-paced at times. And I think we might of encountered the owner, who asked if we would like to go to the “back BBQ restaurant” where they didn’t serve brunch. It was confusing at the time, but their sister restaurant Rose & Sons Big Crow is indeed located through the back, with a slightly altered feel and menu (http://roseandsonsbigcrow.com/menus/). 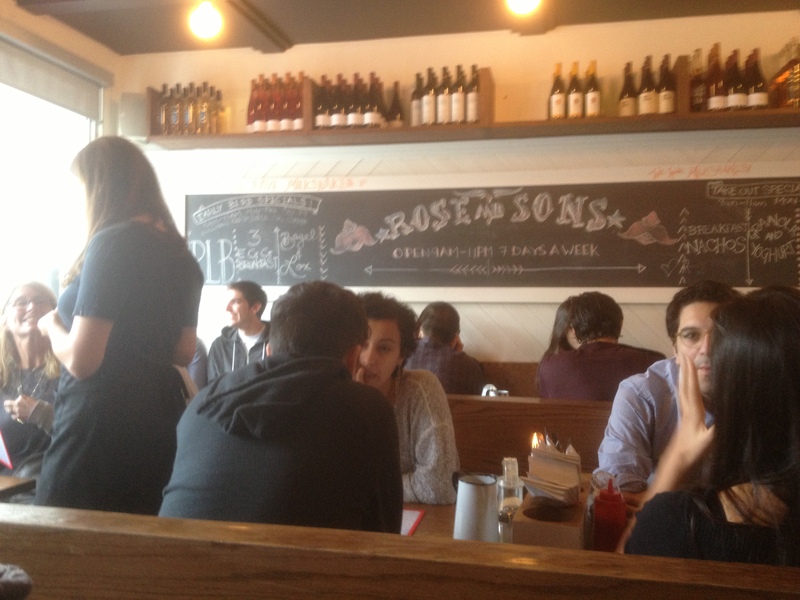 Overall, our experience was pretty good and Rose and Sons might still be finding its groove, from what I read in other reviews. I think the chef himself summed up my experience best- “we do grease good”. Their atmosphere is also pretty hard to beat. But I’m not always in the mood to pay that much for a warm feeling, bitter $3 espresso, and a meal that blows my healthy eating goals to smithereens. 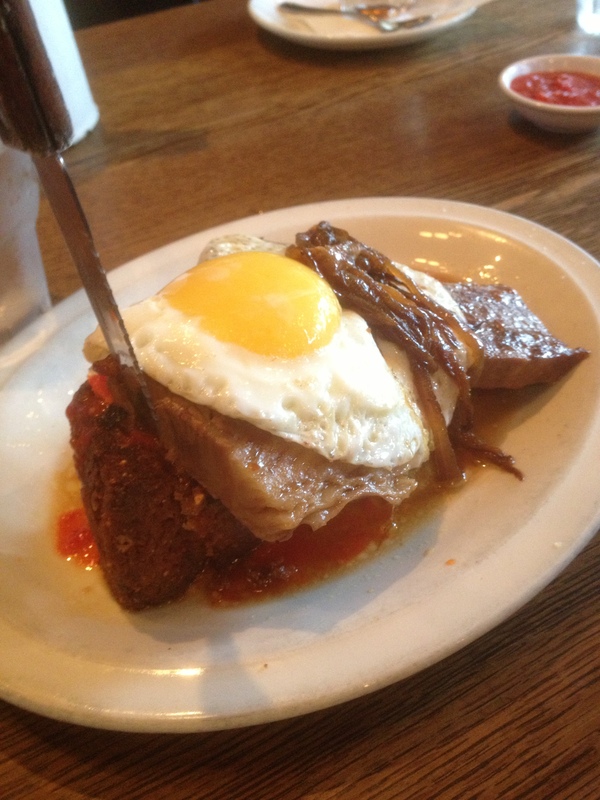 This entry was posted in Breakfast/Brunch, Diner, Recommended, Southern BBQ. Bookmark the permalink.